Acquisitions and capital infusions have helped the company provide LED screens for some of the country’s marquee events. Amid the rolling farm fields of Argyle is a fleet of gray trailers, their sides emblazoned with the words “GO BIG.” The trailers are parked outside what looks like a big brown warehouse in the middle of nowhere—you can’t even see it from the main road. This is the GoVision headquarters, a 50,000-square-foot space dedicated to the design, creation, and storage of enormous video screens. The people here have contributed much to the way the modern world views live entertainment. Think about the last time you attended a sports match or a concert. Large events require large screens—and not just to keep attendees engaged and fired up, but to ensure everyone present has a clear view of the on-stage action. GoVision has provided LED screens for high-profile events all over the country, and the photo-crowded walls of the company’s headquarters are a testament to the places its screens have traveled: from golf’s U.S. Open Championship to Lollapalooza to the pope’s 2015 visit to the last four presidential inaugurations. 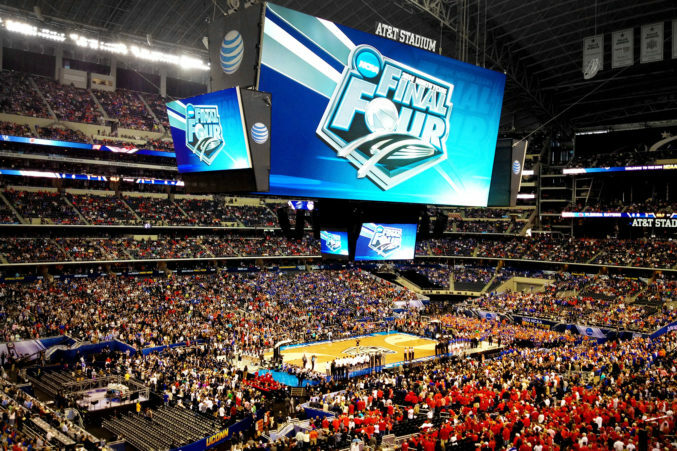 GoVision’s LED screens are showcased at the NCAA’s Final Four. Curtis graduated from Texas Christian University. In 1987, he co-founded Motion Graphics, an experiential marketing company that used custom vehicles to advertise for companies like PepsiCo and NEC Corp. In 1991, British rock band Genesis wanted to use Sony’s Jumbotron as a backdrop for its concert tour, so Motion Graphics built the first portable version of the screen. After the tour ended, Curtis purchased it from Genesis and formed a new company called Screenworks—the predecessor to GoVision. He sold his interest in Screenworks in 1998, but, a few years later, a new technology caught his attention. “I was watching the LED market and thinking, ‘This is going to change everything,’” Curtis says. LED screens lasted longer, were lighter, and consumed less power than Jumbotrons. They were also a lot less expensive. In 2002, Curtis started GoVision with one LED screen on a truck. At the time, there was little competition, and business grew steadily. Seven years ago, an analysis showed that GoVision had about 30 competitors. Now, Curtis estimates, there are between 300 and 400—though only a handful can do large-scale events. GoVision hit a period of substantial growth from 2013 to 2015. The business nearly tripled in size, jumping from 24 to 72 employees. During that stretch, GoVision acquired five small companies, including content provider Graystone Media and media support company Events Cable and Sound. The acquisitions helped GoVision expand its repertoire of services, which grew to include live show production, creative and graphic services, and fabrication and installation. Curtis estimates that about 20 percent of the company’s business now comes from installation. One flashy example is a free-standing, center-hung video screen called the Colossus, designed for Bristol Motor Speedway in Tennessee. The four-sided screen weighs about 700 tons and is one of the largest of its kind in the world. In late 2015, Curtis sought capital in order to continue GoVision’s expansion, and, in 2016, the company was acquired by Plano-based Learfield. The acquisition helped GoVision manage its growth while allowing the company to function fairly autonomously. “We’re a small business that’s a large player in a high-profile niche,” Curtis says. GoVision’s screens have showcased the Ryder Cup, the Bush library groundbreaking, and countless smaller-scale church and community events. The transportable screens range in size from 9 by 16 feet to 19 by 33 feet—or about 627 square feet. Curtis says that the company’s most basic product rents for $4,500 a day. A larger project solution can range up to seven figures. GoVision’s rental inventory includes five different kinds of modular gear, approximately 25,000 square feet of LED screens, and 21 truck- and trailer-mounted units. The company has grown to 80 full-time employees and has enjoyed about 20 percent growth over the last two years. And it expects to add plenty more event photos to the walls of its headquarters; Curtis estimates that his screens will appear at more than 1,000 events in 2018. As events expand, the future of entertainment will likely demand even more large screens. In addition to filling that need, Curtis believes that the development and innovation of GoVision’s event technology services will play a big role in the company’s future. And, unbeknownst to those who pass by, these developments will originate in the workshops of that nondescript warehouse in the fields of Argyle.